GURNEE, Ill. (WLS) -- Three people flew into O'Hare Airport from Orlando on Tuesday to commit several credit card frauds in north suburban Gurnee. 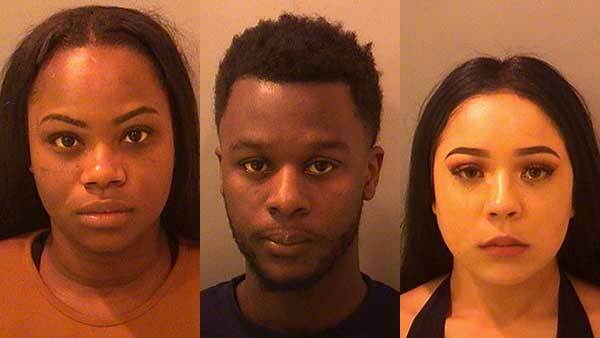 Gurnee police said the three suspects flew from Orlando to O'Hare International Airport, rented a car, and drove to Gurnee for the sole purpose of committing credit card fraud. Officers were able to track down their rental car at a nearby hotel Wednesday and arrest 22-year-old Stephine Jean Phillippe, 21-year-old Tariq Henderson, and 18-year-old Elizabeth Garcia, all from Orlando, with four counts of identity theft and seven counts of altered or counterfeited credit card. The offenders are expected to appear in bond court in the next few days, police said.